Modern medicine has recognized that pregnant women not only can, but should continue to exercise and move throughout their pregnancy. Exercise not only benefits the mother, but the baby as well. Many pregnancy journals or exercise websites will recommend walking and swimming as the best prenatal cardio exercises. These are certainly great choices. But, the reality is that sometimes you can’t get to a pool or the weather doesn’t permit an outdoor walk. Plus, who can do the same exercise routine for nine months? That’s why we’ve put together a 20-minute low-impact workout specifically for the mom-to-be. This cardio workout will keep you at a low to moderate intensity and give you five different exercises, so you don’t overtrain on one particular move. Your new body and center of gravity is going to continuously change and likely feel different nearly every day! So the variety in this workout will help prevent repetitive-use injuries. 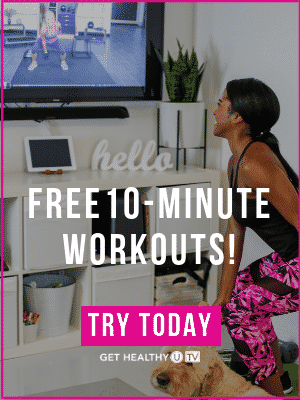 This 20-minute workout is designed to keep your heart rate at a moderate level and does not require any equipment! You will perform each exercise for one minute at a low intensity followed by 30 seconds of moderate intensity. Then, move to the next exercise. After one time through, you’ll rest for one minute, take in some much needed water, and then repeat the entire set once more. Begin by marching in place for one minute to get the body warm and ready for movement. Perform for one minute at low intensity immediately followed by 30 seconds of moderate intensity. A) Start standing with feet wider than shoulder distance apart and turn both feet in one direction allowing the hips to follow like you’re in a shallow lunge. The front knee is a 90-degree angle and the back heel lifted. Arms are in guard position in front of the chest. B) Drive the back knee up to hip height towards the hands, and hands in towards the thigh. Return the foot to floor and repeat. Perform for one minute on the right knee at low intensity then 30 seconds at moderate intensity. Then repeat with the left knee. A) Stand with feet slightly wider than shoulder distance apart and bend knees slightly. Tighten the core to keep your center still. B) Punch out one arm at a time at a steady pace. Punch for one minute at low intensity followed by 30 seconds of moderate intensity. A) Start standing with arms at the chest and hands in fists. B) In a quick shuffle motion, lift your feet off the ground about an inch. You can shuffle in place quickly or back and forth. Perform for one minute at low intensity followed by 30 seconds of moderate intensity. Shuffle for one minute at low intensity followed by 30 seconds of moderate intensity. Now rest for one minute, get water, and begin at the top again. If you want more prenatal cardio, try our full Baby Bump Fitness System on Get Healthy U TV! Great post. Love seeing people promote exercise during pregnancy!